To Cite: Sadegh Fazeli M, Kazemeini A R, Jafarian A, Bashashati M, Keramati M R. Temporary Trans-jejunal Hepatic Duct Stenting in Roux-en-y Hepaticojejunostomy for Reconstruction of Iatrogenic Bile Duct Injuries, Trauma Mon. 2016 ; 21(2):e21115. doi: 10.5812/traumamon.21115. Background: Bile Duct Injuries (BDI) during cholecystectomy are now being recognized as major health problems. Objectives: Herein, we present our experience with handling major BDIs and report long-term outcome of hepaticojejunostomies followed by trans-jejunal hepatic duct stenting performed to reconstruct extra-hepatic biliary tracts. Materials and Methods: In this case series, we prospectively collected data of 22 patients, who underwent first time biliary reconstruction through Roux-en-y hepaticojejunostomy followed by hepatic duct stenting using a trans-jejunal bifurcated 6F tube drain. The long-term outcome was assessed and defined as excellent (asymptomatic, normal liver enzymes and bilirubin levels), good (asymptomatic, mild abnormality in liver enzyme and bilirubin levels), poor (symptomatic, abnormal liver enzymes and bilirubin level) and failure (requiring reoperation). Results: A total of 22 patients including four males (18.1%) and 18 females (81.8%) were evaluated. The mean age was 42.71 (range: 23 - 74) years. Twelve patients had undergone open cholecystectomy (54.5%) and the rest had a history of laparoscopic cholecystectomy. The mean interval between the primary operation and reconstruction was 92.71 days. The mean follow-up period after biliary reconstruction was 42.33 (range: 1 - 96) months. No instance of anastomotic leakage or stenosis, biliary sepsis, thromboembolic event, or respiratory infection was noted in the long-term follow-up. The outcome was excellent in all patients. No case with poor or failure of result was noticed. Conclusions: Although a devastating complication iatrogenic major bile duct injuries can be corrected surgically with a high rate of success. Temporary trans-jejunal stenting of the hepatic ducts can help in maintaining the integrity of anastomosis without stenosis or biliary sepsis. A great majority of injuries of the extrahepatic biliary duct system are iatrogenic, occurring in the course of laparoscopic or open cholecystectomies (1, 2). Injury to the bile duct during cholecystectomy is a devastating complication. Bile Duct Injuries (BDI) require surgical reconstruction to re-establish biliary-enteric continuity. It is a common belief that BDIs, even if treated surgically, condemn patients to lifetime disability. With wide spread adoption of laparoscopic cholecystectomy (LC) during the past 20 years, in spite of its numerous advantages over open cholecystectomy (OC), there was an obvious increase in the number of patients with iatrogenic BDIs. Incidence of BDIs in LC has been reported around 0.3% - 4.5%. This is approximately two times higher in OC in comparison to LC (3-11). A number of series reporting long-term evaluation for biliary function after biliary-enteric reconstruction for bile duct injury have published in the literature. Roux-en-Y hepaticojejunostomy is currently the most common procedure used by biliary surgeons to repair iatrogenic BDIs. Even though the series in the literature have shown various outcomes following these operations (12-19), most of the reported series describe patterns of injuries, patients' characteristics and their surgical intervention. Considering the rate and severity of complications related to biliary reconstruction, we aimed to present and review long-term results of our experience with handling major BDIs using Roux-en-Y hepaticojejunostomies followed by trans-jejunal hepatic duct stenting. In this cross-sectional study, we prospectively collected data from 22 consecutive patients with iatrogenic injury incurred during the course of a cholecystectomy that were referred to Imam Khomeini medical complex (affiliated to Tehran University of Medical Sciences) for biliary reconstruction, between years 2001 and 2012. Informed consent was obtained from each patient included in this study. The study protocol conformed to the ethical guidelines of the 1975 declaration of Helsinki. Demographic data and results of diagnostic and therapeutic procedures before and after referral, including laboratory data and imaging studies were obtained for all patients. Long-term follow-up data of 22 cases were analyzed. Injuries were classified according to the classification method introduced by Strasberg et al. (Table 1) (20). A Injury to small ducts in continuity with the biliary system, with a leak in the duct of Luschka or the cystic duct. B Injury to a sectoral duct, with resultant obstruction of a part of the biliary system. C Injury to a sectoral duct with bile leak; bile leakage occurs from a duct not continuous with the biliary system. D Lateral injury to the extrahepatic biliary ducts. E1 Stricture > 2 cm from the bifurcation of the right and left bile ducts. E2 Stricture < 2 cm from the bifurcation of the right and left bile ducts. E3 Stricture at the bifurcation of the right and left bile ducts. 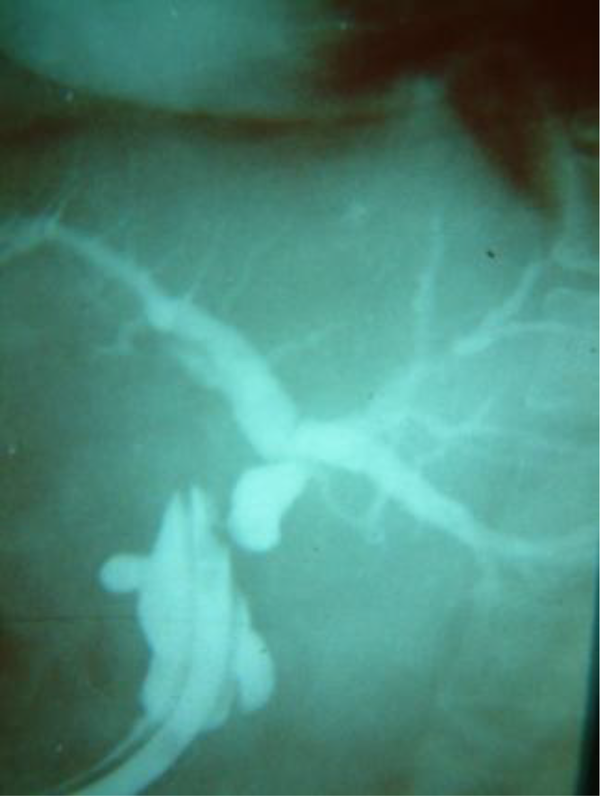 E4 Stricture involving the right and left bile ducts; the left and right ducts are not continuous. E5 Complete occlusion of all bile ducts, including sectoral ducts. The operative procedure involved a right subcostal incision. After taking down adhesions to the undersurface of the previous incision (in the case of open cholecystectomies), an attempt was made to dissect the hepatic hilum. 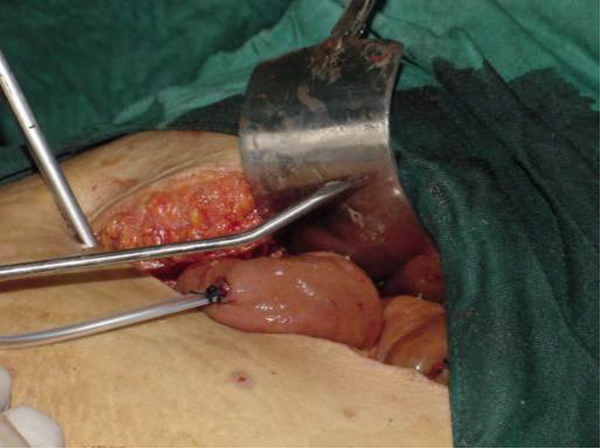 In patients, who had undergone open cholecystectomy or had biliary leakage and intra-abdominal infection, this dissection especially entailed a considerable portion of the operative time. In no case were the portal vein or hepatic arteries injured. Having located the site of injury, the dissection was carried, proximally into the hilar plate, to provide adequate length of hepatic duct confluence or left and right hepatic ducts. In some cases, more than one orifice became evident on the right. Next, a jejunal Roux limb was brought into the hilar area in a retrocolic fashion to which the ductal stump was anastomosed in an end-to-side configuration using 4 - 0 or 3 - 0 long-lasting absorbable suture materials. The length of the limb was between 50 and 70 cm, and the distance from the ligament of Treitz was around 20 - 30 cm. Before completion of the anastomosis an access loop was constructed: a 6F plastic Drain (hemovac) was cut bifurcated at its distal end, longitudinally for about 3 - 5 cm, and each limb was inserted into the left and right orifices. Next, the drain was passed through the lumen of the jejunal limb for about 15 - 25 cm and brought out of the bowel with a silk purse-string suture (Figure 1). The exit site of the drain from the bowel was sutured to the entrance site of the drain into abdominal wall with two silk sutures. Another drain was placed routinely in the sub-hepatic space adjacent to the anastomosis. It should be mentioned that the distal portion of the common bile duct or common hepatic duct was not ligated, even in cases for which ligation was possible. During the post-operative period, laboratory data as well as occurrence of complications were recorded. All patients underwent contrast tube/catheter cholangiography before discharge. Subhepatic drains were also removed within the first three to four post-operative days before discharge. The follow-up consisted of evaluations two weeks, one, six and twelve months, and on an annual basis thereafter. The duration of follow-up was calculated from the date of the last intervention. In each follow-up session, history and physical findings as well as serum liver enzymes, bilirubin levels and ultrasound study were recorded. 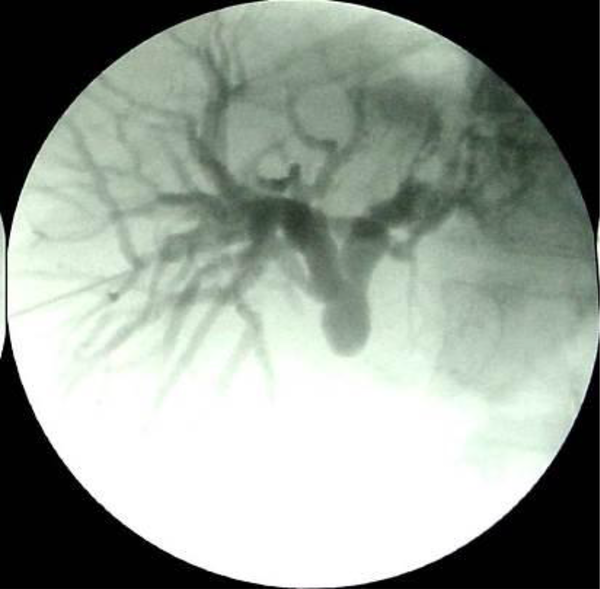 During the first visit at two weeks following the operation, a contrast cholangiography was also performed and then the drain was removed if the result of the contrast study indicated no stenosis or leakage. The clinical outcome was assessed and defined as excellent (asymptomatic, normal liver enzymes and bilirubin levels), good (asymptomatic, mild abnormality in liver enzyme and bilirubin levels), poor (symptomatic, abnormal liver enzymes and bilirubin level) and failure (requiring reoperation). Statistical analysis was performed using the SPSS 12 software for Windows. Chi-square test was applied for the analysis. Of the 22 patients, there were four males and eighteen females with a mean age of 42.71 (range: 23 - 74) years. Demographic data of the patients in addition to their previous history of cholecystectomy have been summarized in Table 2.
aValues are expressed as No. (%) or mean. Twenty injuries were noted in the post-op period. Of these, in 15 patients (68.1%) injury was detected in less than a month from cholecystectomy. In the remainder, the injury was detected between 1.5 and 6 months (mean: four months) post-operatively. In two patients, injury was detected during cholecystectomy; after establishment of drainage, the patients were referred to our clinic. Icter was the most common presenting clinical finding detected in 19 (86.3%) patients, followed by pruritus in ten (45.4%), fever in nine (40.9%), and peritonitis in five cases (22.7%). All patients with signs of peritonitis had undergone emergent laparotomy to decontaminate the abdominal cavity and establish open drainage. One patient had undergone percutaneous drainage of infected subhepatic biloma. For all patients an abdominal ultrasound was performed. endoscopic retrograde cholangiopancreatography (ERCP) and magnetic resonance cholangiography (MRC) were also performed in 14 (63.6%) and 12 (54.5%) patients, respectively. 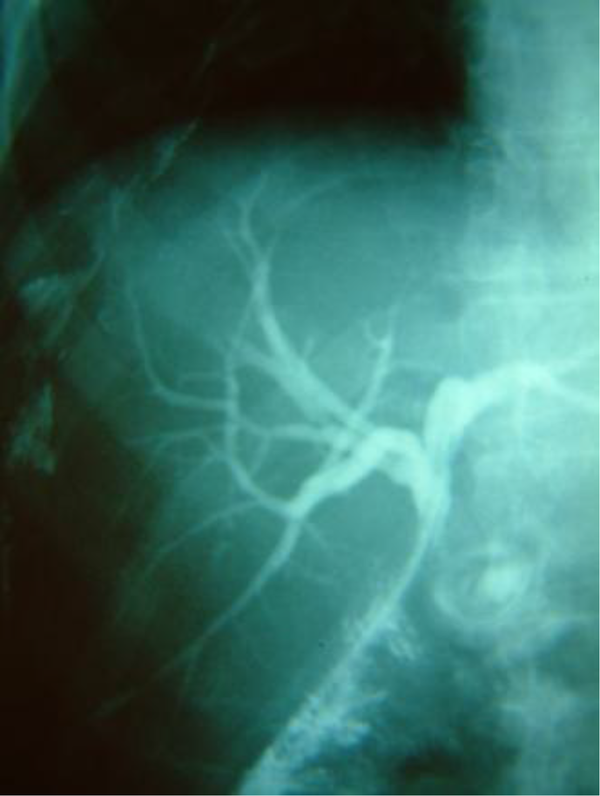 One patient underwent Percutaneous Trans-hepatic Cholangiography (PTC). None of the patients had ultrasonographic evidence of cirrhosis (ascites, splenomegaly and characteristic hepatic parenchymal echo pattern) before reconstruction. (Figures 2 and 3) Abnormal liver enzymes were detected in 12 cases (54.5%) in their pre-operation visit. The mean serum total and direct bilirubin levels were 12.26 (range: 0.3 - 27.8) and 8.00 (range: 0.2 - 19) mg/dL, respectively. The mean level of serum alkaline phosphatase was 898.16 (range: 210 - 1940) IU/dL. All injuries in our series were of class E (Strasberg classification). Class E2 was the most common form of injury, being present in 14 cases (63.6%) followed by Class E1, E3 and E4 in five (22.7%), two (9%) and one (4.5%) patient, respectively. The mean interval between index operation and reconstruction was 92.71 days. The mean post-operative hospital stay was 13.5 (range: 5 - 27) days. Most of the delay in discharge was due to ileus and poor oral tolerance. There was one case of wound infection. No instance of anastomotic leakage, diagnosed thromboembolic event, or respiratory infection was noted. The mean follow-up period was 42.33 (range: 1 - 96) months. Overall, the outcome was excellent in all patients. No case of poor outcome or failure was noted. There was no correlation between injury class and outcome (P = 0.740). Three patients failed to appear at preset dates and were followed up for less than six months; however, all of these three patients had excellent outcomes in their last visit. One of our patients showed mild abnormality in liver enzymes in the first three months yet the liver enzymes reached normal levels (excellent outcome) in long-term follow-up. For patients who were followed-up for at least four years (19 patients), all had excellent outcomes. Of the 22 evaluated patients, BDI in our patients were mostly after open surgery. Moreover, almost all BDIs were missed and were only detected in the post-operative period or later. This may be due to the fact that most of our patients were from less privileged areas where intra-operative cholangiography is under-performed. Intra-operative cholangiography is done in 20 to 35% of cases (21-25). None of our patients underwent reconstruction by the primary surgeon indicating that a few BDIs were identified during cholecystectomy. Those surgeons, who detected the injury, referred the patients right after establishing an open drainage. It is important to delineate the anatomy of the injured biliary tract preoperatively, as patients who have bile duct repair without cholangiography or with incomplete cholangiography usually have an unsuccessful outcome (26-29). We found very few proximal injuries (Strasberg E3 and E4, involving bifurcation and more proximal areas, respectively). De Reuver et al. reported Bismuth class 4 and 5 injuries in 26.5% of the patients (30). In addition, proximal injuries (Bismuth 4 and 5) were observed in around 20% of patients, as reported by Lillemoe et al. (21). Another report indicated E4 class of injury in only 8% of the patients (31). The high prevalence of E1 and E2 classes of injuries in our series may be due to misidentification of CBD and the cystic duct. Although end-to-end ductal anastomosis has been recommended by some recent studies (32, 33), the Roux-en-Y hepaticojejunostomy is generally considered as the preferred method for surgical treatment of extrahepatic biliary tract injuries. Hepaticoduodenostomy has also been considered as an acceptable surgical option (16, 17). In our patients, we routinely inserted the stent at the site of anastomoses as this lowers the probability of postoperative stricture; even though some studies have found equivalent results without stenting (34, 35). The complications of trans-hepatic biliary stenting, such as leaks, extravasation at the liver dome-stent or partial stent dislodgment have also been reported (12, 25, 36, 37). Our data showed no case of biliary stenosis or sepsis in the long-term follow-up. We also believe that stenting allows easy access for diagnostic and therapeutic interventions. One of the major complications of hepaticojejunostomy is anastomotic stricture, which is observed in 4%-10% of patients (26, 28, 38, 39). In our patients, we did not observe this complication. In conclusion, trans-jejunal stenting of the hepatic ducts during reconstruction can help in maintaining the integrity of anastomosis without complications such as stenosis or biliary sepsis. Moreover, trans- jejunal stenting allows easy access for further diagnostic intervention following the main operation, which is devoid of the complications of conventional jejunostomy. We acknowledge the staff of the department of surgery for their kind support during this project. Authors’ Contribution: All authors have contributed equally in all parts of this research including study concept and design, acquisition of data, analysis and interpretation of data, drafting of the manuscript, critical revision of the manuscript for important intellectual content, statistical analysis, administrative, technical and material support, and study supervision. Funding/Support: This study was done in hospitals affiliated to Tehran University of Medical Sciences.